Requirements: Windows or Windows-compatible OS. SwordSearcher is a comprehensive Bible study system with an easy-to-use interface, for both devotional and in-depth study, lesson and sermon prep, and personal spiritual growth. - Standard-setting Bible searching power. - Huge library without the hassle and cost of printed books. - Use the Topic Guide for topical studies. - Use the Verse Guide for instant library lookups based on verse or passage reference. - Locate related passages of Scripture with the Find Related Verses search, and use the Treasury of Scripture Knowledge with over 500,000 cross-references. In addition to making Bible searches fast and simple, SwordSearcher includes a Topic and Verse Guide system to make accessing a massive amount material as simple as typing in a verse reference or subject. Indicate any passage to study, and SwordSearcher will instantly show every book, commentary, topical, or dictionary resource that references the verse or passage. The Bible display system presents Bible text in a useful, easily-read format with links to reference material to the side of each verse. While studying Bible text, any passage that inspires you to further study can be researched with just a few clicks. All library text in SwordSearcher is smartly integrated so that navigating between reference works and Holy Scripture is seamless. SwordSearcher's study library includes a lifetime of study library resources, with commentaries, topical guides, encyclopedias, dictionaries, and other books; and hundreds of maps, charts, and illustrations from trusted Bible scholars such as Matthew Henry, Adam Clarke, John Wesley, Spurgeon, Mackintosh, Clarence Larkin, and many others. 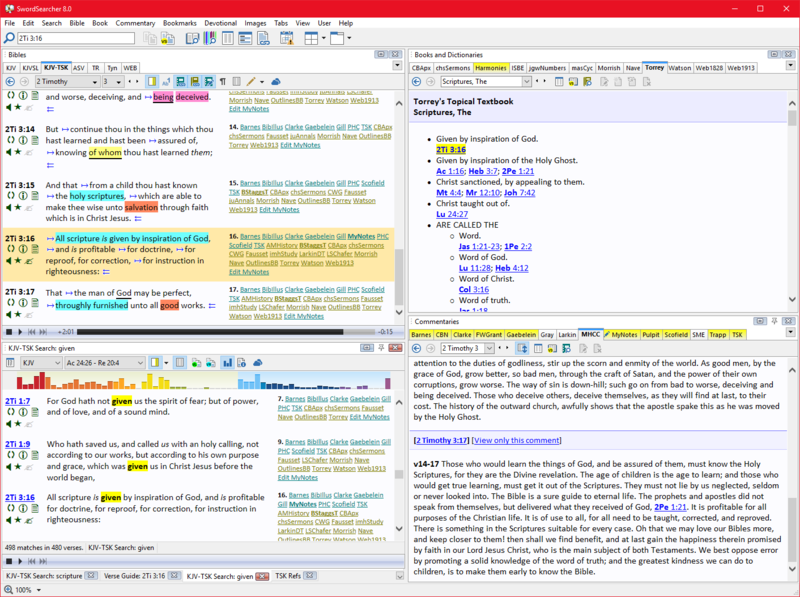 The ease of use, scope, and power of SwordSearcher is unmatched, and you can expand the library with your own material, add your own highlighting to the Bible panel, and more. Improved customization support. New search tools. Additional study library content. An easy-to-use database and a scheduler. Church Scheduler is a specialized software that assists churches and other religious organizations in organization and automation of daily events. is an audio Bible, unlike any other you may have used before. Instead of simply being a recording of someone reading the Bible, theWord uses Apple's powerful voice synthesis to "read" the Bible to you. Research over 130 Bibles with maps, references, commentaries and research tools. iPhone and Android too! bible study,bible software,bible,christian,concordance,sermons,commentary,dictionary,search,reference,verse,devotional Bible study software, with hundreds of volumes of books and references. Far more than a Bible concordance, offering powerful search and study tools. Includes commentaries, dictionaries, maps, illustrations, and topical guides.